On Monday afternoon, around 3:30 local time, Giants pitcher Hunter Strickland threw a 98-mph fastball at Bryce Harper's hip in the top of the 8th with two outs and nobody on. Harper responded by charging the mound and the world will never be the same. Below you will find a recap of the fight in 10 still frame; the idea was taken from the great Sam Miller article after the Jays-Rangers fight last year. First picture: Posey sets up for an inside fastball (if you go back and watch the video, Strickland shook off Posey's first sign for an off-speed pitch). I wonder if Posey knew it was coming at this point. Bryce looks an awful lot like Hugh Jackman's Wolverine character here. Terrifying. By this point, Harper has thrown his helmet and one punch—both inaccurately. And Buster has only taken one step toward the mound. Heck, the umpire has had enough time to get halfway and stop to watch. Please send that hat to the Hall of Fame. 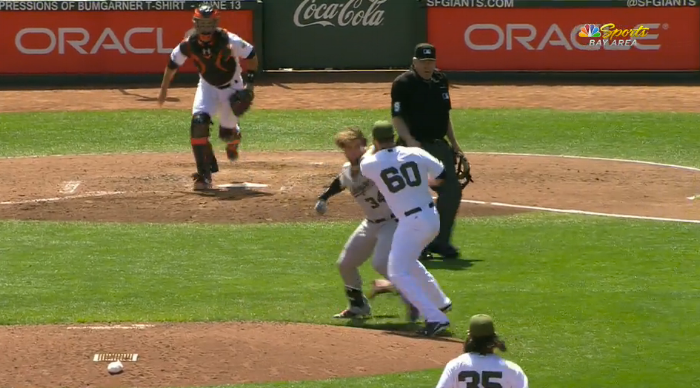 Hunter Strickland's restraint: three Giants players and two coaches. Does the team psychologist have any openings Tuesday? Bryce Harper's restraint: Ryan Zimmerman. Would you trade him for all the Giants it took to restrain Strickland? The story of the baseball that hit Bryce Harper. It bounces off Harper and lands about 10 feet from home; it would have been a great bunt. Someone most certainly hits it in the scrum, right? The ball is somehow still untouched. Coaches from both teams share an embrace in the middle. The Nationals broadcast shows this angle looking towards the first base line. A mystery ball! My best guess is it came from the Nationals bullpen. Just a couple boys doing karate.